Published: Dec. 4, 2016 at 10:59 p.m. Updated: Dec. 5, 2016 at 04:08 p.m. Opportunity is the name of the game in fantasy football. Talent matters, of course, but we want players who see a healthy volume of targets and touches to anchor our lineups, especially in daily fantasy. Every week in the second season of the Opportunity Report, we'll look at all the passing targets for every NFL team and the percentage each player owns. Franchise will handle the backfield touches section this year and his Week 13 piece is tabbed above. David Johnson leads the team with 41 targets since the team's bye. That's great for Johnson, but it also speaks to the broken nature of the Arizona offense. Fitzgerald's role remains constant, but beyond that, we're chasing ghosts in the wide receiver corps. Taylor Gabriel looked like his playing time was on the upswing heading into this game, but he was only on the field for 38 percent of the Falcons offensive plays. He did not break any big plays today, but was clearly a focal point when on the field. Julio Jones had another injury issue this week, which slowed his hot start and had him in and out of the fourth quarter. He should be good to go next week, but the injuries are mounting for Jones, especially this season. Outside of Jones and Mohamed Sanu, no wide receiver played more than 40 percent of the snaps or saw more than three targets. Despite winning the game 38-6, carrying a 24-0 lead into halftime and controlling the action throughout, the Ravens still threw a whopping 47 passes. Headed into Week 14, the Ravens are second only to the Cardinals with 502 passes thrown on the season. The volume is there in this offense, even if it has been painfully inefficient (24th in net yards per attempt, 19th in first downs). Dennis Pitta and Steve Smith have been the top targets for most of the year, and they along with Mike Wallace led the way on Sunday. Pitta made up for lost time in scoring two touchdowns. He had not scored since December 2013, and led the NFL in yards from scrimmage without a touchdown this season before today. Breshad Perriman scoring on a long catch and run was nice to see, but he was on the field for just 29 percent of the team's plays. Chasing anything in this passing attack's output today is inadvisable given the way the rest of this season has gone. Sammy Watkins played on 67 percent of the Bills offensive plays, which was a step up from last week despite suffering a setback this week in practice. He also led the team in targets with nine. With Watkins back out there, the other Bills pass-catchers return to mostly irrelevant status, as no one besides LeSean McCoy caught more than four passes or registered more than 35 yard receiving. The Panthers got bumped off script early and fell behind. Kelvin Benjamin played fewer snaps than both Ted Ginn and Corey Brown by game's end, likely in an effort to keep their top receiver healthy. Although, Greg Olsen was still out there for 100 percent of the plays run. Either way, this team looks like it's only headed for more disarray going forward. Marquess Wilson is no stranger to injury, and he suffered yet another one (groin) on Sunday. He played just four snaps before his untimely exit. This comes a week after Wilson was re-establishing some of the momentum that looked long since gone in his NFL career. With Wilson out, Josh Bellamy stepped up to lead the team in targets. He did, however, go out on 63 percent of the team's plays, which was fewer than Cameron Meredith and Deonte Thompson. With Matt Barkley playing competent football behind center, despite the wintery conditions in this game, the Bears passing attack remains relevant. We've preached here that Brandon LaFell has the better opportunity on his plate with A.J. Green out. We saw that come to fruition this week. LaFell out-targeted, out-snapped and consequently out-produced Boyd this week. Boyd was just a 66 percent player while LaFell was out there for 94 percent of the team's plays. Upside is dictated by usage, and the usage is still in the veteran's favor. With Dak Prescott throwing just 18 passes on Thursday night, there was not much volume to go around. Luckily, it appears the hyper-efficient version of Dez Bryant has returned to Dallas. Bryant has 33, 30, 22, 28, 14 and 40 percent of the team's targets in the games he's played since returning from injury. Dak Prescott took the next step in his evolution, which was graduating from a spread-out passer to correctly identifying his top playmaker and getting him the ball in his hands in key moments. 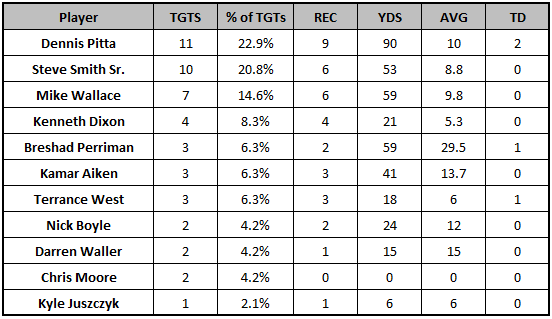 No player outside of Demaryius Thomas and Emmanuel Sanders saw more than one target on the day. We always talk about the Broncos as a highly-concentrated passing offense, but that was even more drastic with rookie Paxton Lynch under center. With Marvin Jones a late scratch with a thigh injury, Golden Tate carried the volume in the passing game. Not only did he lead the team in targets, he also was the only player to snare more than 50 yards receiving. He finished with 145 yards on the day, the most of Week 12 (heading into Sunday Night Football). Eric Ebron took a step forward after a goose egg on Thanksgiving. He played on 76 percent of the team's plays and saw six targets. Davante Adams' hot streak came to an end against a strong Texans pass defense. Aaron Rodgers was able to find other areas to exploit on a day where passing productivity was limited with some serious snow in Green Bay. The featured player in the offense appears to be a moving target with Jared Cook, Adams and now Jordy Nelson all owning that title the last three weeks. That's good news for the Packers, whose passing game is right up there with the best in the NFL. Speaking of Cook, that one-week explosion against Washington is looking more and more like an outlier. He has just six targets since garnering 11 in that contest. His snap share has not approached the 61.8 percent he played against Washington. We finally got DeAndre Hopkins back in the end zone, a sight unseen since Week 5 against the Vikings in garbage time. He needed a busted play to take a catch 44 yards to the house on his score this week, coming against a Packers secondary that gets embarrassed on almost a weekly basis. This is still a moribund passing game, as no pass-catcher had more than 60 yards receiving and C.J. Fiedorowicz led the team in targets while averaging under 10 yards per reception. Blake Bortles completed just 45 percent of his passes at 4.3 yards per attempt. It was a disastrous outing, much like all of his games this season, and it once again held back the productivity of the entire offense. With matchups against Minnesota and Houston next up on the schedule, it's unlikely we see much good from this unit to close the year. Travis Kelce had his third-straight 100-yard receiving game in the last three weeks, and his fourth in the last six. He's taken his game to a new level, and the team is seeing what he can do as the No. 1 target with Jeremy Maclin out. This usage may not continue when Maclin returns, but Kelce is making it hard to imagine why he should be anything but the featured top target. Tyreek Hill went out on just 49 percent of the Chiefs' plays run, compared to 85 percent for Chris Conley and 77 percent for Albert Wilson. While he out-produced those two combined, it's hard to project a reliable floor for him with that limited playing time doled out. With Tavon Austin inactive, Brian Quick jumped into an expanded role. Quick went out for a whopping 94 percent of the team's plays, second only to Kenny Britt's 96 percent share. Those garnered by far the majority of the target volume in the offense. Tavon Austin-handcuff, Pharoh Cooper played on 67 percent of the plays, but garnered just one catch for eight yards. Jarvis Landry collected a season-high 14 targets in this game due to the negative game script the Dolphins played in all afternoon. Miami lost the game 38-6 and offensive centerpiece Jay Ajayi only garnered 12 carries to 40 pass attempts from Ryan Tannehill. It's quite clear that the Dolphins need to be a bad team for Landry to stuff his numbers and gain more volume. DeVante Parker playing with a back injury was something of a surprise, and he went out for just 78 percent of the plays run, which was behind both Landry and Kenny Stills. He had an up-and-down came, a hauling in a red zone touchdown, while also getting out-fought in the end zone on a Ryan Tannehill interception. The Vikings tried to push the ball downfield more, as Sam Bradford averaged 8.7 air yards per attempt before the final drive, but to no avail. The lack of pass protection, big-play downfield threats, and the way it's all come together to sap this passing game of productivity has ruined the Vikings' season. Adam Thielen remained a big part of the game plan despite Stefon Diggs being active. Thielen saw more snaps and targets than his counterpart. Malcolm Mitchell continued his strong play and saw far more playing time than he did in Week 12. He went out for 84 percent of the Patriots plays, second only to Chris Hogan among wide receivers. Mitchell only trailed Julian Edelman with a 22.9 percent share of Brady's intended air yards. This is clearly a breakout happening right before our eyes, and with Rob Gronkowski out for the rest of the regular season, there is not much that can stand in his way to continue this march. After more of a rotational approach last week, Michael Thomas, Brandin Cooks and Willie Snead played 86, 82 and 79 percent of the offensive plays this week. If you're looking for a reason the entire Saints offense disappointed, look no further than the pace at which Detroit played. Holding the ball with short, effective passes to extend drives and limiting the Saints' play count proved to be a winning strategy. Saints: 57 plays, 23:08 time of possession. The Saints led the NFL in offensive plays run this season with an average of 70 per game coming into Week 13. The Lions, who have played slow for months now trying to hide their defense, managed to keep them under 60. Odell Beckham had double the targets of the next highest thrown-to Giants receiver, Sterling Shepard. The passing game did display its true broken nature on Sunday, with Eli Manning completely unable to push the ball downfield with any regularity. Beckham only carried a 9.8 average depth of target, and while Shepard registered a much higher 14.3, he ended up averaging just 5.3 yards per actual reception. Victor Cruz, who did not receive a target, appears to be losing playing time to rookie Roger Lewis. Cruz was on the field for 44 percent of the plays, whereas Lewis was out for 49 percent. Michael Crabtree was the clear lead-dog on Sunday, especially in scoring positon. The veteran receiver absorbed four red zone targets, with Mychal Rivera the only other player to get a target inside the 20-yard line. Crabtree has out-targeted Amari Cooper with a whopping 31 over the last three weeks to his counterpart's 16. Cooper has made two big plays, including a 37-yard deep shot in this game. However, the usage for Cooper is slightly concerning for his prospects down the stretch. Whether by intent or the fact that Jordan Matthews was out with injury, Nelson Agholor returned from his one-week benching to go out on 100 percent of the Eagles' offensive plays. Dorial Green-Beckham was making some minor noise with his opportunity, but a Carson Wentz hospital ball took him out of the game with an injury. Paul Turner is a player the local media talks up and apparently the team has a fondness for. His first catch went for 41 yards and he led the team in receiving yards. Yet, he played less than 60 percent of the snaps. He lives. Ladarius Green went out for a season-high 49 percent of the offensive of the offensive plays, 26 of 34 of which were passing plays. Green led the team with a 31.4 percent share of the team's total targets. He's officially a major part of this offense, and with no wide receiver more than 70 percent player, that's a coveted role to have behind Antonio Brown and Le'Veon Bell. San Diego ran just 53 offensive plays on Sunday, which makes it tough for any pass-catcher to bust out. Couple that with Melvin Gordon leading the team in targets and receiving yards, and it was an out-of-character game for the Chargers pass-catchers. Tyrell Williams looked like he was playing the role of decoy after coming into the game with a torn labrum. Williams did not receive his first target until there was 4:32 left in the third quarter, which was intercepted and taken back for touchdown, despite being on the field for 96 percent of the team's plays. Luckily, on the next play the Chargers ran, Williams busted off a 40-yard touchdown. Here are some facts: In this snowy game no 49ers wide receiver played 70 percent of the team's plays, but Vance McDonald went out for 91 percent and led the team in targets. My duty to report facts on this NFL team's passing attack is done. Last week provided some hints that Tyler Lockett could be more involved this week. Jermaine Kearse was on the field more than both Lockett and Doug Baldwin, that was likely due to a run-heavy game script in a blowout. Lockett caught five of his six targets and scored on a 75 yard rushing touchdown. He should only be more of a big-play factor going forward as Seattle marches on to another playoff berth. Emerging superstar corner Casey Hayward gave up just 16 yards on two catches out of 20 plays where he covered Mike Evans. Jameis Winston showed a good ability to find his ancillary threats, most notably Cameron Brate. Veteran receiver Cecil Shorts suffered a serious injury after just three plays and will miss the rest of the season. In his stead Freddie Martino went out for 44 percent of the plays, while Russell Shepard stepped into the No. 2 role with 76 percent. Both of these players will have some potential down the stretch to put up some productive games with Shorts vacating playing time. Yet, beyond Evans and then Brate there are mere scraps to pick at in Tamp Bay's target distribution. Jamison Crowder looks like he's cemented himself as the top wide receiver on the team. Despite seeing seven of his eight targets from the slot, Crowder was on the field for 84 percent of the plays, compared to 79 percent of Pierre Garcon and 77 percent for DeSean Jackson. We did see a similar uptick in playing time for Crowder the last time Jordan Reed missed multiple games, so that could also be a factor here. Another trend that carried over was Vernon Davis being a full-time player, going out for a whopping 98 percent of the team's plays. Davis recorded five catches in a tough spot against the Cardinals, who allow the lowest yards per game to tight ends.